Posted on July 16, 2014 by Amanda Evans Posted in Essential Oils, Homemade Recipes, More Crunch	. About eight months ago, I (attempted to) implement a beneficial Ayurvedic regimen known as “oil pulling” into my daily routine. I shared what I had learned and experienced in the beginning in a previous post, Adventures in Coconut Oil – Oil Pulling, which I hope you’ll check out if you’re looking for more information on getting started. In this update, I must admit that I cannot claim to have oil pulled every day for the last eight months. I stuck with it for a couple of months and then let it fade away as I likely followed other whims for a bit. I returned, tried different approaches, and just accepted it as an awesome option whenever I felt like it. I always do better with things when I first let myself off the hook about it. Whether you are looking to try oil pulling for the first time, or you have mastered a 20-minute morning swish, here are some little inspirations from my personal experience to deepen your experience with this traditional, detoxing, practice. –I’ll start with an addition that makes me look forward to oil pulling everyday. 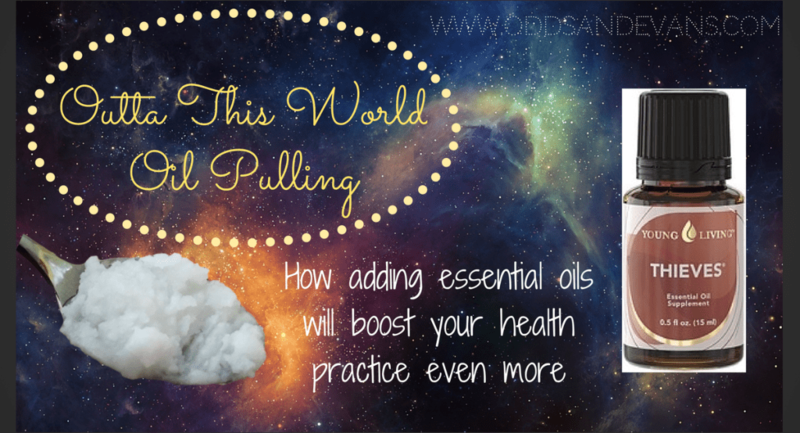 A way to make oil pulling even MORE incredible is to add a drop of essential oil to your spoonful. No need to mix ahead of time; just pour a single essential drop on top and swish it all together. Or you can put the drop under your tongue before adding the base oil. My favorite essential oil is Thieves oil blend which boosts the immune system and decreases tooth sensitivities. Thieves blend is anti-viral, anti-bacterial, anti-septic, and anti-infectious (compilation of research links here). Super duper way to mess up an impending illness’ evil plans! I also use Thieves oil for my homemade mouthwash, toothpaste, and all-purpose cleaner. I’m really digging this Thieves oral care brand as well, when I don’t feel like making my own products. Hear Thieves? Think “immune”. I also love Peppermint oil which gives me fresh breath as well as an energy boost. I will use peppermint oil in my oil pulling if I have a headache or for my digestive system. This EO is also known to help promote feelings of fullness (aka curb cravings…like the flavor of gum only better for you). Lemon oil is another wonderful option because it is famous for cleansing and detoxing. The lemon oil I use is 68% of d-limonene which is a very efficient antioxidant. This addition in the morning can uplift my mood and brighten the day. Essential oils can provide an added benefit of stronger immunity, but quality is everything when it comes to what goes in/on your body! Just like your base oil should be purely unrefined, it is super important to make sure you know where your essential oils come from. All three of these oils are part of the Young Living Premium Starter Kit, which is the best way to explore essential oils I’ve found. You can learn more about essential oils here at this growing section of my blog, too. –The texture of coconut oil was really challenging for me to overcome. You can melt it first to swish in liquid form, but it is easier for me to spoon it straight out of my container, which is usually solid. Although CO melts fairly quickly in your mouth, I switched to sesame oil for a bit and personally found I could swish more pleasantly. –Some days I use a teaspoon, others more like a tablespoon. Each day is different. My goal is 10 minutes although 15-20 is what you’ll commonly see recommended for the full benefits. I figure every little bit helps. Heck, sometimes I simply do it right before a get-together or photo shoot or some event where I’d like my teeth to look whiter. Seriously, try it and see how your teeth look instantly cleaner. –Aim for a chewing, up-and-down type of motion to best clean your mouth. It really should be a pushing and pulling of the oils around your teeth. –It doesn’t HAVE to be done first thing in the morning. Some people prefer doing it at night. I do it at any point in the day now, whether I’ve eaten or not yet. For some, it is just easier to do on an empty stomach, but if it doesn’t bother you, do it whenever you can. Brush your teeth after so that oil doesn’t remain on your teeth ALL day, but I’ve relaxed about brushing immediately. I generally oil-pull, eat, then brush because that makes sense to me. –Remember that oil-pulling is removing toxins from your body, so spit it out in the trash can. This is also important since you don’t want the thick oils to harden in any drain pipes. Are you an oil-puller, too, or do you hope to be? Any tips you can share with me or any questions I can try to answer for you? I would LOVE to hear from you below!